Do you know why your business needs professional graphic design? Is DIY sabotaging your professionalism? Your first clue that your graphic design efforts might not be “professional” could be as simple as a friend asking what program you used to create your flyer. Yes, unfortunately, your friend has pegged your flyer as a DIY project, in other words, not professional. How this happens is a topic for several blog entries. But, fact is, you want your customers/clients to know that your skills are competent and up to date, that the services you offer meet your customers’ needs and that your experience and expertise allow you to deliver a superior product or service at a competitive price…in short, that you are a professional. Unfortunately, using marketing tools that are clearly not professional, effectively counters your claims of professionalism. The example below demonstrates what I’m talking about. 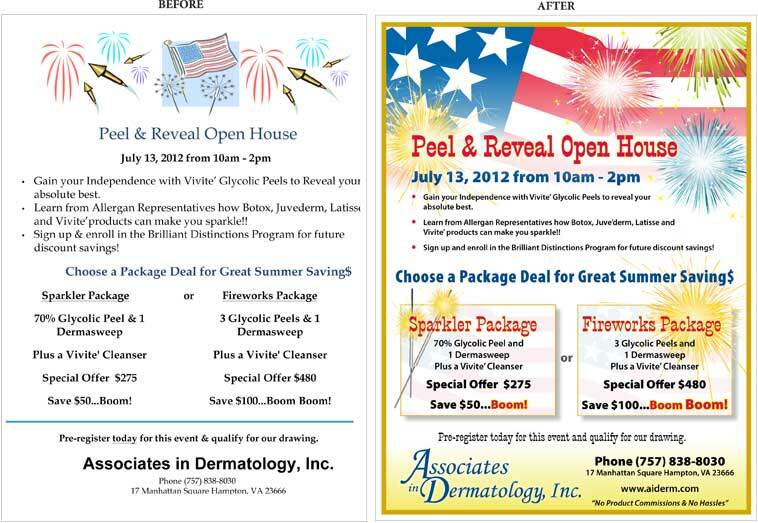 The flyer on the left (BEFORE) was created in-house using MS Word. It’s well organized and easy to read…not a bad job. On the other hand, the flyer on the right (AFTER) was created by Art of Communication using professional graphic design software and professional design expertise to generate the energy and attention needed to actually increase service sales. You use professional services in many aspects of you business. 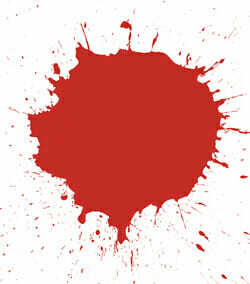 Professional graphic design is simply another critical service to add to your arsenal of business tools. Do you know why your logo should be a vector graphic? If you want your logo to be reproduced in a large-print format…say a vehicle wrap, signage, banner or billboard, you definitely need to develop it as a vector-based graphic. This is because a vector graphic can be hugely enlarged (up scaled) with no loss of resolution. That means the exact same vector graphic file can be used on a postage stamp or a billboard. Vector graphics are made by using points (vectors) and paths to create expandable shapes. Typically, vector graphics are created using Adobe Illustrator (my preference), Corel Draw, Freehand…think “drawing” program. Look for an .eps file format extension. On the other hand, creating a logo in PhotoShop, for instance, will create a pixel-based graphic file, which cannot be enlarged beyond the standard for which it was created. So, for example, if a four inch by four inch pixel-based file is created for the web it will need to have 72 dots (pixels) per inch (dpi), while that same file created for print production will need at least 300 dpi. Any attempt to enlarge a pixel-based file beyond those parameters will cause the resulting image to look “pixelated.” PhotoShop is the most common application used for creating pixel-based file formats…think “paint” program. Common file formats include: .psd, .jpg, .gif, .png. The last two are web-based files. 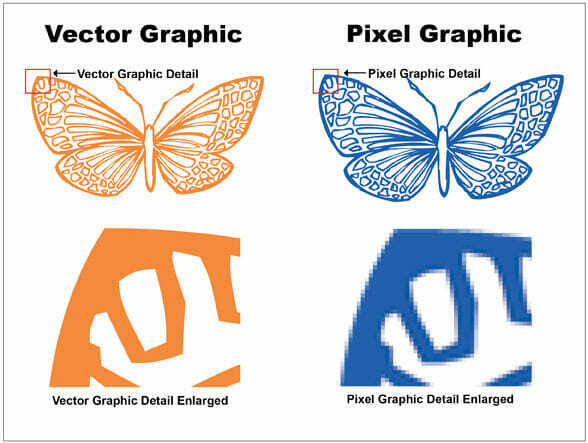 The following graphic illustrates the basic difference between vector-based and pixel-based graphics. Is your business card living up to its potential? 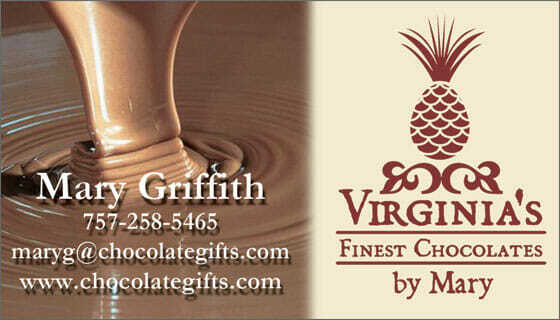 Mary Griffith’s business card, looking luscious! Often taken for granted, your business card is mini marketing with mega potential. Why is it so useful? Well…it’s small…it’s portable… it packs a wealth of information in a tidy package…it’s mini-marketing with mega-potential. Very often it is the first, and sometimes, the only marketing tool business people have at their disposal. Given the potential of this essential networking tool, it’s important to consider what it says about you. Is it ACCURATE? Make sure the impression you generate with your business card exhibits professionalism. Don’t circulate a business card with crossed out or inaccurate information. Does it make SENSE? Can your potential customer or networking contact “read” your business card quickly? Can your client find your name and business contact info without searching? Is it INTERESTING? Will your contact remember you or your card tomorrow? Art of communication uses design creatively to enhance the readability of your business card…not obscure it. Be sure to include this essential tool in your collection of marketing and networking strategies. And don’t take it for granted; take time to make it work for you. Do you need HELP? If you want your business card to really work for you, put Art of Communication to work honing your message to a fine edge.